Canadaâ€™s Diamond Industry â€“ Did You Know? A recent report by BHP Billiton, Rio Tinto and De Beers Canada â€“ operators of the Northwest Territoriesâ€™ EKATI (now operated by Dominion Diamond Corporation), Diavik and Snap Lake diamond mines â€“ details the transformative impacts the diamond industry has made in the NWT in its relatively short history. 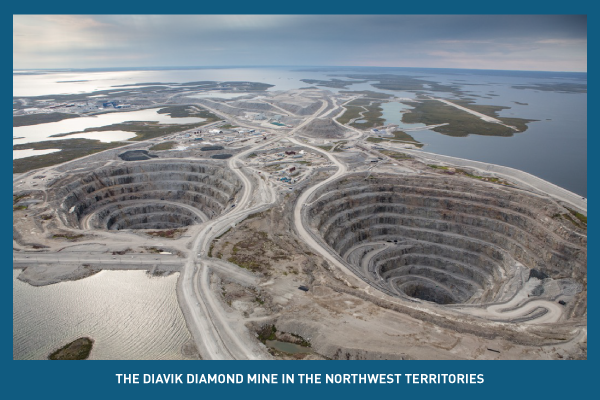 The report, Measuring Success: The Positive Impact of Diamond Mining in the Northwest Territories (1998-2012), demonstrates the significant role mining has played in generating economic development in Canadaâ€™s North. Since diamonds were discovered in the territory some 20 years ago, the three mines have helped shape a sustainable future for the region and its residents through jobs, business development and community investments. The mines have spent billions with northern and Aboriginal businesses. From 1996-2011, the three companies spent $12.8 billion to build and operate the mines. Of this, $9.25 billion (72%) was spent with northern companies and joint ventures, including $4.2 billion (33%) of the northern spend with Aboriginal companies. This level of Aboriginal business participation is unprecedented in the North, if not in Canada. In 2011, the mines collectively employed 1,541 full-time northern workers, 403 more jobs than what was predicted during the minesâ€™ environmental assessments. Diamond mining brought a surge of employment. From 2001-2011, the territoryâ€™s employment rate was nine points higher than the national average. 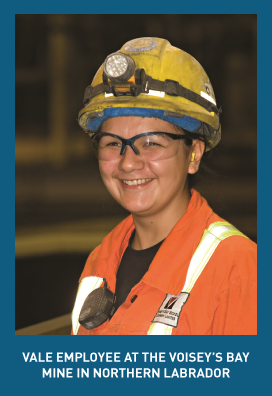 The three mines have invested heavily in local skills-training programs, often in partnership with governments, Aboriginal communities, educational institutions, and with training agencies like the Mine Training Society of the NWT. As of 2012, more than 1,400 people have received training for well-paying jobs at the diamond mines. The three mines have spent tens of millions on social investments for local communities, supporting recreational facilities, education and training opportunities, sports teams and cultural activities. Millions have been generated for governments of all levels, contributing to infrastructure upgrades, social programs, schools and healthcare services. The report also reinforces that building and operating mines is not easy, particularly in Canadaâ€™s North where companies face higher operating costs, a lack of critical infrastructure, significant human resource constraints, and a highly-complex regulatory environment. The diamond industry has quickly become one of Canadaâ€™s biggest mining success stories. How much do you know about this fascinating industry? In Canada, diamond exploration began in the 1960s, but it was not until 1991 that the first economic diamonds deposit was discovered in the NWTâ€™s Lac de Gras region. Canada officially became a diamond producer in 1998 when the EKATI diamond mine, located 300 kilometres from Yellowknife, opened. The EKATI mine, originally built and operated by BHP Billiton, is now 80% owned and operated by the Dominion Diamond Corporation, one of MACâ€™s newest members. Several new diamond projects are currently planned, including the proposed Gahcho KuÃ© mine in the NWT (a joint venture between De Beers and Mountain Province Diamonds), Stornowayâ€™s Renard Diamond Project in Quebec, and Shore Goldâ€™s Star-Orion South Diamond Project in Saskatchewan. Canadaâ€™s only diamond mine south of the 60th parallel is De Beersâ€™ Victor Mine located near Attawapiskat, Ontario. A diamond from the mine is setting a record for the largest Canadian diamond that will be mined, cut and polished in Canada. The rough diamond is 37 carats and is being cut by Crossworks Manufacturing, which purchased the rough diamond from De Beers. The final size and value of the cut and polished stone is not yet known, but some estimate it will fetch more than $1 million at retail. The federal government has recognized Vale for best practices in Aboriginal training. The last federal budget explained that with growing opportunities for resource development, the private sector is increasingly providing trade programs and pre-employment training to help ensure Aboriginal communities are able to benefit from economic development. The Vale mine and concentrator project in Labrador was highlighted for providing training specifically geared to increasing Aboriginal employment. For background, the Voiseyâ€™s Bay mine was developed on the traditional lands of the Labrador Inuit and Innu and was completed in 2005. Vale is currently developing Phase 2, an underground mine alongside the existing mine, which will cost $1 billion to build and employ some 800 people during constructionâ€”an increase of 400 full-time employees, most of whom will come from local Aboriginal communities. Phase 1 of the mine has led to more than 50% of Aboriginal employment from local Labrador communities, and more than 80% (about $140 million) in contracts were awarded to Aboriginal businesses in 2012. These successes stemmed from early engagement and employment during the mineâ€™s development phase to prepare the local workforce for jobs during construction through to commercial production. For Phase 2, Vale will continue building its strong relationship with First Nations communities and will engage the federal government on its new funding envelopes announced in Budget 2013. Federal Aboriginal Skills and Training programming called Joint Education and Training Authority (JETA), developed as a pilot for Voiseyâ€™s Bay, was key to building strong relationships with local communities and generated impressive employment for the Inuit and Innu. The JETA model has evolved into what is now the Federal Skills and Partnership Fund, which also supports similarly successful programs in British Columbia, the Northwest Territories and in the Ring of Fire in Ontario. The Government of Canadaâ€™s decision to renew the Geo-mapping for Energy and Minerals (GEM) program is a positive and welcome investment that will help facilitate exploration activities in Canadaâ€™s North. Building on a previous allocation of $100 million over five years from Federal Budget 2008, the governmentâ€™s renewed commitment of $100 million over seven years will carry this important work forward to the benefit of the mineral industry, northerners and all Canadians. â€œOur investment in resource exploration will continue to unlock the full economic, mineral and energy potential of the region, while generating new government revenues, private sector investment and jobs. This critical knowledge will also help Northerners make informed decisions about land use and preserve our Northern environment." During his northern tour in August, Prime Minister Stephen Harper announced support for several skills training organizations, including investments for the Northwest Territories Mine Training Society and for the creation of a new Centre for Northern Innovation in Mining in the Yukon. Both of these programs aim to help Aboriginal peoples and northerners obtain the training and skills required for positions in the growing mining industry. These programs, like the highly successful BC Aboriginal Mine Training Association and the recently announced new training program in Ontarioâ€™s Ring of Fire, are strongly supported by MAC as critical investments for enabling full participation of Aboriginal peoples in the mining sector. This fall, MAC kicks off its latest ad campaign promoting the contributions of the Canadian mining industry. Currently in market in the National Capital Region, the ads continue to illustrate miningâ€™s connection to modern products and its contributions to society. New to this year is a series of ads that showcase the many community investments Canadian mining companies are making in countries all around the world from real-life examples from Barrick Gold, Rio Tinto and IAMGOLD. The ads will be appearing in the lead-up to MACâ€™s annual advocacy day, Mining Day on the Hill, which will be held on November 19, 2013. MAC is pleased with the federal governmentâ€™s progress toward finalizing the Canada-European Union Comprehensive Economic and Trade Agreement (CETA). The EU is Canadaâ€™s second largest export market for Canadian metals, the third largest market for non-metals, and the fourth largest market for mineral fuels. On an annual average between 2010 and 2012, Canada exported $20.4 billion worth of metal and mineral products to the EU, led by precious gems and metals. Key exports included gold, nickel, diamonds, aluminum and iron ore. Upon implementation, the new agreement will eliminate 98% of Canadian and EU tariffs, while phasing out remaining tariffs over time. Beyond the reduction of tariffs for metal products, the agreement expands into areas of investment, labour mobility and enhanced regulatory cooperation. CETA is the first bilateral trade agreement in which Canada has included provisions on regulatory cooperation. By fostering cooperation earlier in the regulatory process, differences in approaches between Canada and the EU may be reduced, resulting in fewer barriers to trade once regulations are put into place. CETAâ€™s temporary entry provisions will make it easier for highly-skilled professionals, such as engineers and senior managers, to work in the EU and vice versa. Further, investment provisions in CETA are anticipated to provide greater certainty, stability and protection to investments from both respective jurisdictions. The Paul Stothart Memorial Scholarship in Mineral Economics has officially entered its second year. The scholarship, valued at $3,500, was established in 2012 from the generosity of MAC member companies in memory of the late Paul Stothart, MACâ€™s former Vice President of Economic Affairs. The scholarship will be awarded annually to a Canadian university student who shares a similar passion and talent for mineral economics as Paul had. Qualified candidates must be studying either a Bachelor or Master of Economics, or a Master of Business Administration at a Canadian university. Students can submit their applications until May 15, 2014 and the scholarship will be awarded for the 2014-2015 school year. For more information about the scholarship and eligibility, please visit the MAC website.